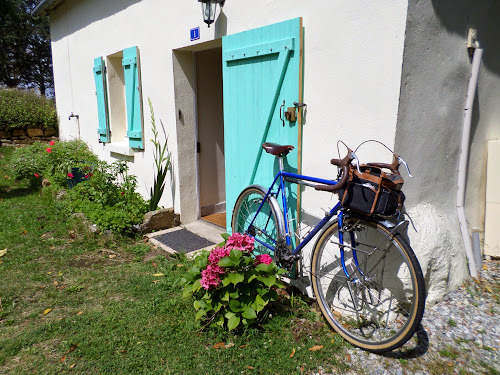 And so, we arrive at our usual return stop at Pete & Keith’s beautiful chambre d’hote. This year, however, I have booked the gîte for a full week to allow S to recover from nine days of roughing it with only my lentil and bean curry to eat. The weather seems to be on the turn, i.e. raining, so the gîte comes at an opportune moment – all in the plan I say to S . . .
We are having a ‘recovery few days’ . . . lounging about in the garden and gentle strolls to see the sights. We set off to see the menhir a couple of miles down the road – I was hoping for something onnthenscale of la roche tremblant at Huelgoat so that I could test S’s thigh muscle development over the previous two weeks, but in the event we never made it as far as the rock. Why? Well, regular readers will know that I cannot resist a bargain and, as we were making our way down the remote country lane toward the la roche, what do I see but a cornucopia of blackberries, practically falling off the bough such is their abundance. 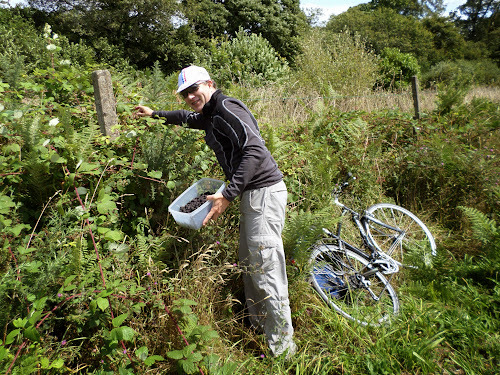 Unfortunately, we were without suitable containers, so legged it back tout suite to the gîte, donned the long-sleeved blackberrying gear, and retuned en velo to lay waste to the crop like the 8th plague of Egypt. 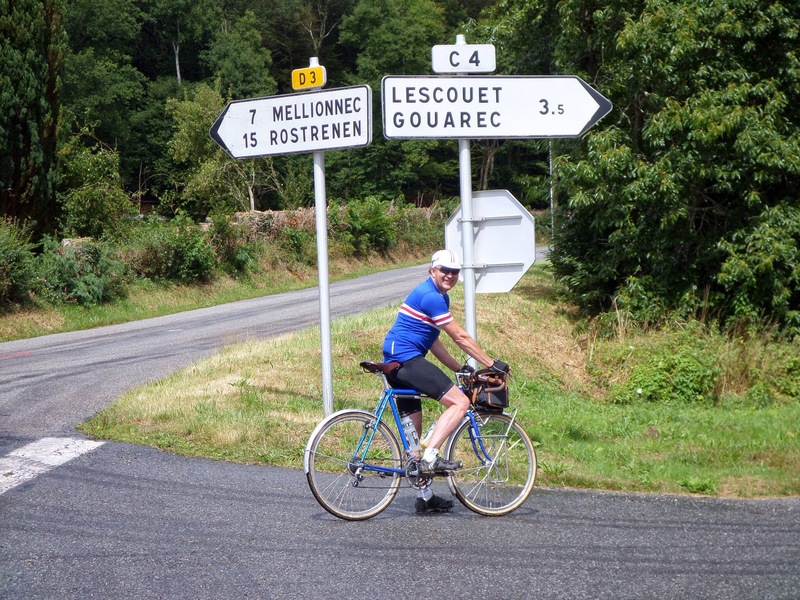 Today we explored the sourrounding countryside en velo by way of Chateaux Launay, Plouërdut and Guémené-sur-Scorff – unfortunately they were all ferme lundi. Nevertheless, it was a day of surprises . . . Surprise 1: who should we see in Plouërdut but le chat précieux, or a French relative perhaps. As you can see, she knew who her mère was . . . Surprise 2: we came across this water feature in the middle of nowhere, the kind of thing you might encounter in Yorkshire perhaps, where a retired engineer has exercised his lifetime skills in a more pleasurable pursuit. What is not evident from the photo is that this was an animated scene, the see-saw going up and down, the helicopter rotor trurning, all the machinery rotating away and the various figures going about their business . . . all powered by the flowing stream! 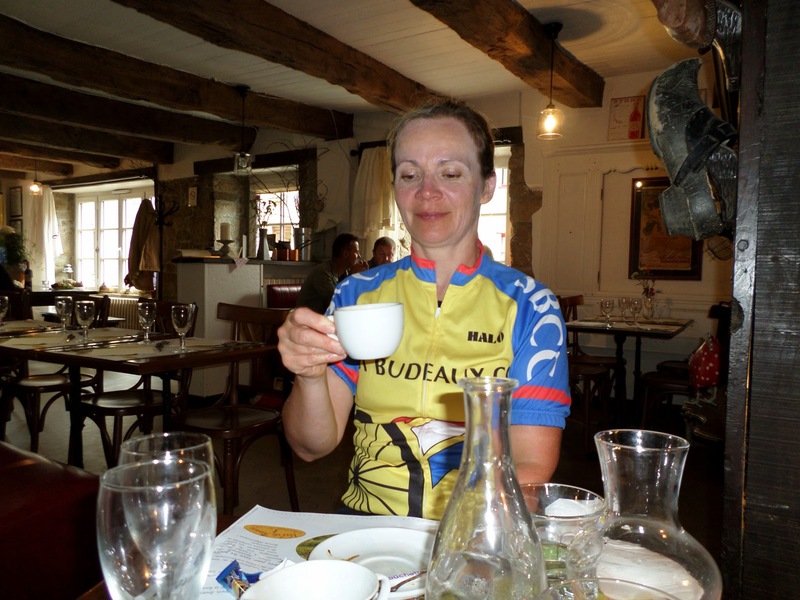 Surprise 3: l’atelier bistrot – what a fantastic restaurant in Langoelan! We had the plat du jour of mussels in gazpacho soup, followed by a main course of poulet with shredded courgette, green beans, roast potato and pea purée, then dessert of apple binet in a mint and raspberry couli, follwed by coffee and half a litre of wine – all for €25! We will return . . .